That day, he went on and robbed not one, but two saving banks in Pittsburgh. A few hours after he had done his job, the police got their hands on the surveillance tape and decided to play it on the 11 O’Clock news. An hour later, an informant identified McArthur in the news video and contacted the police with the man’s name. McArthur got arrested on the same day. Ironically, the same surveillance cameras that he was confident would not be able to capture his face, got him behind the bars. During his interaction with the police, he was incredulous on how his ignorance had failed him. Both the psychologists Dunning and Kruger got story of Mr. McArthur. They decided to study it more deeply. The psychologists were interested to study about the utter confidence of Wheeler that made him believe he’d be able to foil the security cameras with lemon juice on his face. He had the confidence, but he clearly wasn’t competent enough…Why was he so sure he’d succeed? Their study finally demonstrated that the less competent an individual is at a specific task, the more likely they are to inflate their self-appraised competence in relationship to that task. 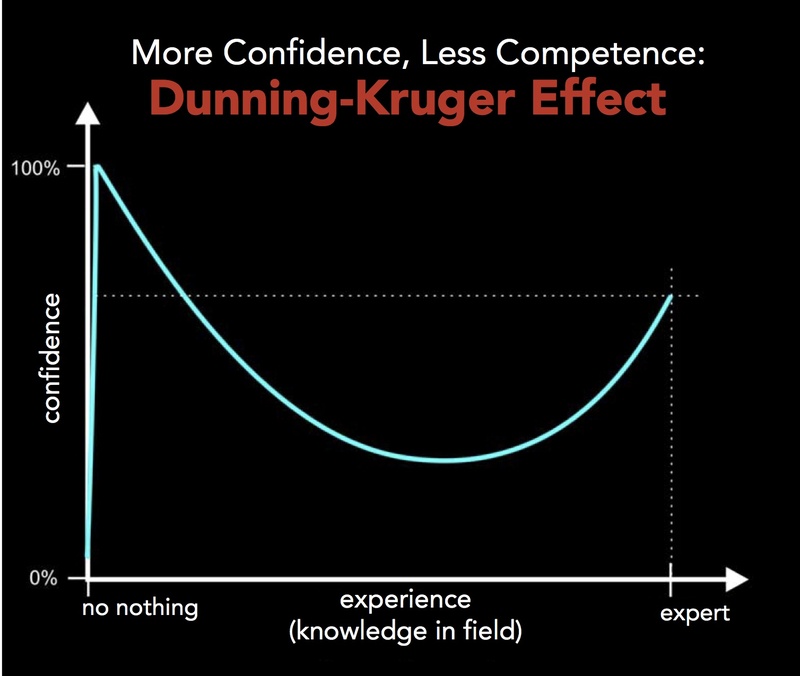 This phenomenon is today known as the Dunning–Kruger effect. At zero experience in the x axis it’s not “no nothing”. It’s *Know nothing (There’s a spelling mistake in the image) – ‘On Finch’ mentioned this in comments below. This effect is clearly observed during the auditions of reality shows like Indian idol (etc). The auditions are usually thronged by a variety of good and bad singers. The ones who are bad at it, never realize their incompetence and yet are genuinely disappointed when they get rejected. Often times, they resort to noisy quarrels too. If you’ve observed carefully, people who aren’t very good at humour or sarcasm often tell poor jokes and expect people around them to laugh hard. But when people don’t laugh, they seem genuinely shocked. It is incredible to see them totally unaware of how bad they are at it. At every place, it is a common tendency of the least skilled people to have an inflated sense of self-competency. Ignorance sure is a dangerous thing. There is no astrologer in the world that can tell you for sure if you’ll die this year or not. But, thanks to Gompertz Law, if you ask me, there is one thing I can tell you for sure – Whatever may be the odds of you dying this year, in 8 years, the likelihood of you dying will double. Your probability of dying during a given year doubles every 8 years. It is amazing, and no one knows how it works exactly. Why does nature pick the number 8, to double our likelihood of death? We’ll probably never know. There is a whole table which relies on census data, and statistically notes the probabilities of people dying at different ages. And when it is plotted on a Probability of death vs. Age graph, you get an exponentially increasing mortality rate with age. That is death coming faster as you get older. Gompertz Law can be verified for real-life data – the 2005 US census data. The following graph and the probability vs. age plotted using the law match almost perfectly. Amazingly, the law holds true for several other countries too. That means, the probability of me, a 25-year-old dying during the next year is very small — about 1 in 3,000. When I become 33, this probability will grow to something around 1 in 1,500. 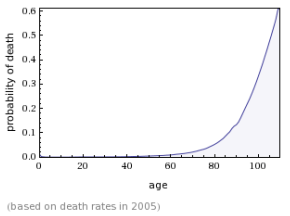 In the next 8 years, the probability of me dying will be 1 in 750, and so on…At the age 100, the probability a person’s death will be about 1 out of 2 – fat chance of successfully moving on to 101! Theoretically, using this data, it can be said with 99.999999% certainty that no human will ever live to the age of 130 (of course only if medicine doesn’t start tampering with human genes, or some other artificial factor). There is one thing for sure – there is almost no chance that you are going to beat Mr. Ming. If you liked this article, do subscribe to my daily newsletter to receive the full articles in your mail everyday. What could be better way to make sure that you learn at least one new thing everyday.